For our first-ever collaboration with another artist, we teamed up with master engraver Neil Hunt of NR Hunt Studio to create the Exeter titanium ring. Neil combines scrollwork evocative of the old west with space age titanium! Neil is renowned in the engraving world for the incredible belt buckles he crafts that are carried by top galleries and beloved by discriminating collectors around the world. Those who have seen the questionable work that passes for hand-engraved these days will appreciate the precision and artistry of Neil’s work in silver, gold, and mokume-gane. 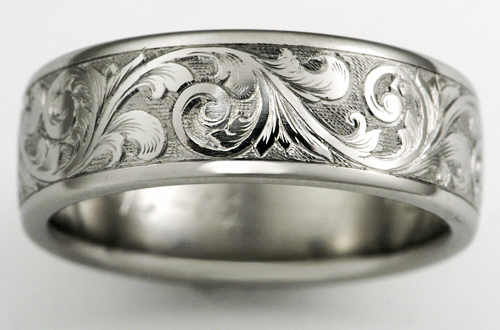 Now imagine how much harder it is to do that kind of quality engraving in titanium! Despite the difficulty, Neil is willing to do it again! 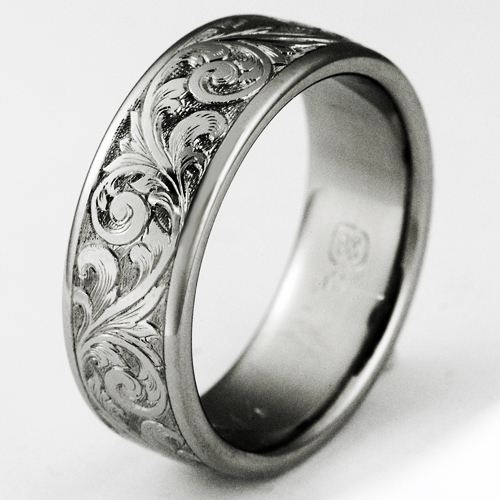 So, contact us to discuss YOUR custom ring and see Neil’s buckles and other exquisite work here.